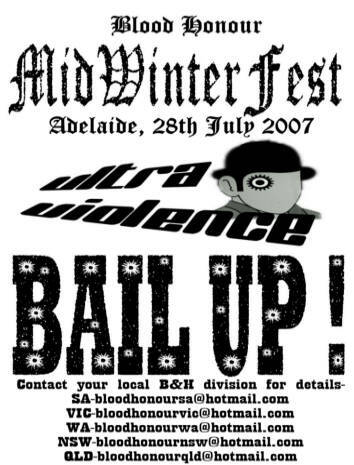 On the 28th of July 2007, comrades from all over Australia gathered in Adelaide to attend the Midwinter Fest being put on by Blood and Honour South Australia. As I arrived early, there were few people at the venue yet, but I noticed that it was a decent sized room for this gig, and the amount of people that was expected to turn out. I became acquainted with some comrades I had not met before and went off to get a bite to eat. When I returned more people started to arrive and an exciting atmosphere began to emerge. What was really good to see, was the range of people who attended, male and female, young and old. This goes to show how Blood and Honour isn't the media stereotype of skinheads being vicious thugs but a community open to all decent white folk. It is also a good sign for the future of Blood and Honour Australia, seeing that there were quite a few young people in attendance. After drinking some beers, meeting new comrades and catching up with old ones, everyone was feeling good and waiting with anticipation for the first band, Ultra Violence. Ultra Violence hit the stage and I can honestly say they did a pretty damn good job covering bands such as Skrewdriver, the Bully Boys and the 4skins. Particular mention has to go to their drummer who was playing a gig for the very first time. Well done mate. As Ultra Violence continued to play, more beer was consumed and more people started to sing and dance along, which was great to see. A particular highlight for me was after Ultra Violence played Skrewdriver's,' 46 Years' the crowd united to salute a true hero of the white race, Rudolf Hess. The second and final band that played was Bail Up! By this time everyone had consumed an ample amount of alcohol and were happily dancing around as Bail Up! 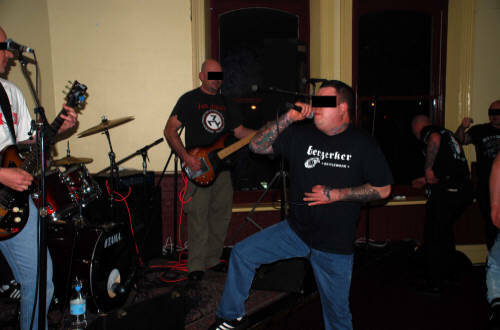 belted out some of their own classics, Bomb the Boats was a huge hit, plus some other songs from bands such as Skrewdriver, the 4 skins and another crowd favourite, Landsers' 88 Rock 'N' Roll Band. A mention must be given to Dougie, who stepped up to sing Smash the IRA, which got everyone singing along and saluting and the atmosphere this created was absolutely amazing. Unfortunately I was helping with filming at this stage, so I could not join in the fun. Bail Up! finished but by no means was the fun over. Everyone went back to the bar for drinks and to catch up with each other. This gig was a great success, and for a gig which in comparison to others such as the ISD, is quite minor, the turnout of about 60-70 people was excellent for a small show like this in little old Adelaide. Everyone enjoyed themselves thoroughly, except for one person who wandered in off the street not knowing what the gig was about, and then complained to the venue's manager about it. All I can say is this person was told to leave if they didn't like it, as they weren't invited and it was a private function. I think the management was much too happy with the profit they'd made from beer sales to care about the concerns of this person. The gig concluded nicely and left everyone waiting in anticipation for the Ian Stuart Donaldson memorial concert in Melbourne in October. A big thank you to everyone who helped organize this gig and to everyone who attended. Hopefully next year the Midwinter Fest will be even bigger and better and will become an annual fixture for Blood and Honour Australia.